A couple weeks ago, I made a cupcake card using BasicGrey’s Nook & Pantry collection. It was such a hit and I loved it so much, I knew I had to make another card using the collection. 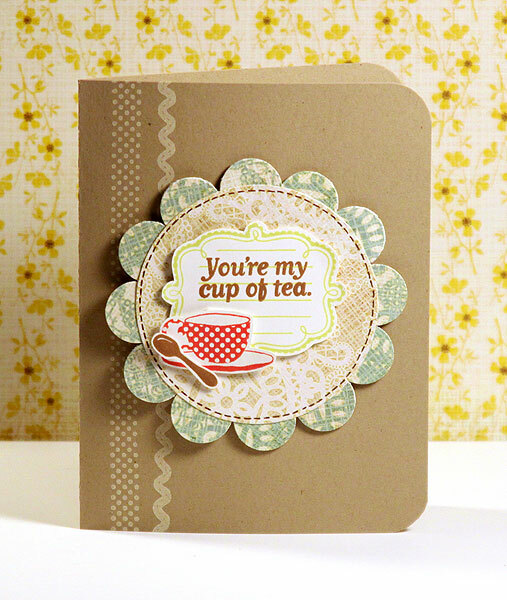 This time, instead of a cupcake, it’s a little teacup from the Cup of Tea stamp set. Now, I’m not a big tea drinker, but I had my fair share of tea parties as a girl, so this little teacup was just calling out to me. Too cute! And then the awesome rickrack and dots came from another stamp set from the collection, Crumpets. Love it!